Identification. India constitutes the largest part of the subcontinental land mass of South Asia, an area it shares with six other countries, including Nepal, Pakistan, and Bangladesh. It has highly variable landforms, that range from torrid plains, tropical islands, and a parched desert to the highest mountain range in the world. Location and Geography. India, on the southern subcontinent of Asia, is bounded on the northwest by Pakistan; on the north by China and Tibet, Nepal and Bhutan; on the northeast by Bangladesh and Burma (Myanmar); and on the southwest and southeast by the Indian Ocean, with the island republics of Sri Lanka and the Maldives to the south. Excluding small parts of the country that are currently occupied by Chinese or Pakistani military forces, the area of the Republic of India is 1,222,237 square miles (3,165,596 square kilometers). Demography. The 1991 census enumerated 846,302,688 residents, including 407,072,230 women, and 217 million people defined as urban dwellers. However, with a population growth rate estimated at 17 per one thousand in 1998, by May 2000 the national figure reached one billion. Life expectancy in the 1991 census was sixty years, and in 1997 it was estimated that almost 5 percent of the population was age 65 or older. The population is still primarily rural, with 73 percent of the population in 1997 living outside the cities and towns. In 1991, the largest urban centers were Bombay or Mumbai (12,596,243), Calcutta or Kolkata (11,021,915), Delhi (8,419,084), Madras or Chennai (5,421,985), Hyderabad (4,253,759), and Bangalore (4,130,288). Linguistic Affiliations. There are four major language families, each with numerous languages. Indo-Aryan, a branch of Indo-European, covers the northern half of the country, and the Dravidian family covers the southern third. In the middle regions a number of tribal languages of the Munda or Austroasiatic family are spoken. In the northeastern hills, numerous Tibeto-Burman languages are spoken. Symbolism. The national flag, which was adopted in 1947, is a tricolor of deep saffron, white, and green, in horizontal bands (with green at the bottom). In the center of the white band is a blue wheel, the chakra , which also appears on the lion column-capital of the Emperor Asoka at Sarnath. This carving, which is over 2,200 years old, is also a national emblem that is preserved in the Sarnath Museum. The sandstone carving features four lions back to back, separated by wheels ( chakra , the wheel of law), standing over a bell-shaped lotus. The whole carving once was surmounted by the wheel of law. The national anthem is a song composed by Rabindranath Tagore in 1911 entitled Jana-gana mana. The nearly useless Saka-era calendar also may be considered a national symbol, adopted in 1957 and still often used officially alongside the Gregorian calendar. Emergence of the Nation. India has a history going back thousands of years and a prehistory going back hundreds of thousands of years. There was a long phase of Paleolithic hunting and gathering cultures parallel in time and characteristics with the Paleolithic peoples of Europe and East Asia. This was followed, eight thousand to ten thousand years ago, by the development of settled agricultural communities in some areas. emerged. After its disappearance around 1500 B.C.E. , there was a bewildering variety of princely states and kingdoms, small and large, throughout the subcontinent, creating a long history of war and conquest that was punctuated by foreign invasions and the birth of some of the world's largest religions: Buddhism, Jainism, Hinduism, and Sikhism. Despite the extent of the Empire of Asoka (272–232 B.C.E. ) and the Mughal Empire (1526–1707), it was left to the last foreign invaders, the British, to establish a unified empire that covered most of the subcontinent during its final century. 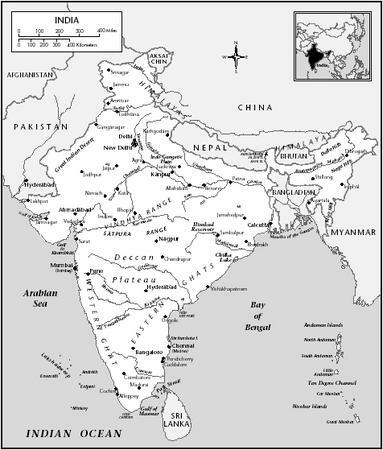 India was ruled by the British government after 1858 through a viceroy and a council, although several hundred "princely states" continued to maintain a measure of independence. The Indian National Congress, founded in 1885, slowly moved from a position of advisor and critic for the British administration toward demanding the transference of power to native Indian politicians. In 1930, the Indian National Congress, led by Jawaharlal Nehru and Mahatma Gandhi, adopted a policy of civil disobedience with a view to achieving full national independence. It was to be a long struggle, but independence was achieved in 1947, with the condition that predominantly Muslim areas in the north would form a separate country of Pakistan. Mohammed Ali Jinnah was to be Pakastani's first prime minister, while Nehru became the prime minister of the Republic of India. The departure of the colonial authorities, including the British armed forces, was peaceful, but the splitting off of Pakistan caused a massive population movement and bloodshed on both sides as a result of "communal passions." A quarter century later, the eastern wing of Pakistan split from that country to become the independent country of Bangladesh. National Identity. National identity is not a major political issue; regional identity and the mother tongue seem to be more important. There are still millions of illiterate people who seem hardly aware that they are Indians but can be vociferous in their support of chauvinistic regional politicians. Thus, India has been plagued with secessionist struggles since independence, the most prominent of which have been a Dravidistan movement in the south, an armed struggle among Kashmiri Muslims for a union of their state with Pakistan, a Khalistan movement among Panjabi Sikhs, and a guerilla movement seeking independence for all the Naga tribes in the northeast. Ethnic Relations. India is home to several thousand ethnic groups, tribes, castes, and religions. The castes and subcastes in each region relate to each other through a permanent hierarchical structure, with each caste having its own name, traditional occupation, rank, and distinctive subculture. Tribes usually do not have a caste hierarchy but often have their own internal hierarchical organization. The pastoral and foraging tribes are relatively egalitarian in their internal organization. Indian shop workers in the main bazaar in Jaipur, Rajasthan. country there has long been a local intercaste and intertribal economy that commonly is based on barter or the exchange of goods and services; since this system has satisfied economic necessities at least partially, ethnic conflict commonly has been dampened or kept under control because of the mutual benefits these economic arrangements provide. In the Indus civilization of 2700 to 1500 B.C.E. , India developed one of the earliest urban societies in the world, along with an extensive trading economy to support it. The walled citadels in some early cities developed into elaborate palisades, walls, and moats to protect the multitude of Iron Age and medieval cities throughout much of the country. The towns and cities are of eight historic types: (1) ancient pilgrimage centers, such as Madurai; (2) local market towns, roughly one every 20 miles; (3) medieval fortified towns, such as Gwalior; (4) ancient and medieval seaports, such as Bharuch (Broach); (5) military cantonments first set up by the British, such as Pune; (6) modern administrative centers such as New Delhi; (7) new industrial centers, such as Jamshedpur; and (8) great modern metropoles such as Bombay (Mumbai) and Calcutta (Kolkata). Architecture developed distinct regional styles that remain apparent. These styles reflect the relative influence of the medieval Tamil kingdoms, Persian and Turkic invaders in the north, Portuguese and British Christianity, and all the distinctive features of the religious monuments of Jainism, Buddhism, Islam, and medieval Hinduism. The landscape is dotted with over half a million villages, and each region has distinctive forms of domestic architecture and village layout. Holy places of the various religions are commonly within villages and towns, but the numerous pilgrimage sites are not necessarily located there. Food in Daily Life. About half the people eat rice as their staple, while the remainder subsist on wheat, barley, maize, and millet. There are thus major geographic differences in diet. Just as fundamental is the division between those who eat meat and those who are vegetarian. Muslims, Jews, Sikhs, and Christians all eat meat, with the important proviso that the first three groups do not consume pork. Lower-caste Hindus eat any meat except beef, whereas members of the higher castes and all Jains are normally vegetarian, with most even avoiding eggs. Food Customs at Ceremonial Occasions. Every caste, tribe, town, village, and religion has a panoply of traditional ceremonies that are observed with enthusiasm and wide participation. Most of these ceremonies have a religious basis, and the majority are linked with the deities of Hinduism. Basic Economy. With a large proportion of the population being located in rural areas (73 percent), farming is the largest source of employment; for hundreds of millions of people, this means subsistence farming on tiny plots of land, whether owned or rented. In most parts of the country, some farmers produce cash crops for sale in urban markets, and in some areas, plantation crops such as tea, coffee, cardamom, and rubber are of great economic importance because they bring in foreign money. In 1996, the gross domestic product (GDP) per capita was $380, and the GDP growth rate was almost 6 percent from 1990 to 1996. In that period, the average annual inflation was 9 percent. In 1994, national debt was 27 percent of GDP. Over the past half century the economy has been expanding slowly but at a steady rate on the basis of a wide range of industries, including mining operations. 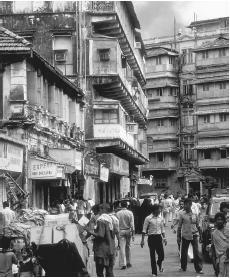 Major cities such as Bombay are considered residential creations of British administrators. The United States has been the principal export market in recent years, receiving 17 percent of exports in 1995 and 1996. Clothing, tea, and computer software are three major categories of exports to the United States. Land Tenure and Property. In an economy based on agriculture, the ownership of land is the key to survival and power. In most parts of the country, the majority of the acreage is owned by a politically dominant caste that is likely to be a middle-ranking one, not a Brahmin one. However, the various regions still have different traditions of land tenure and associated systems of land taxation. India has only recently seen the last of the rural serfs who for centuries supplied much of the basic farm labor in some parts of the country. There are still numberless landless wage laborers, tenant farmers, and landlords who rent out their extensive lands, and rich peasants who work their own holdings. Commercial Activities. India has had many traders, transport agents, importers, and exporters since the days of the Indus civilization four thousand years ago. Market places have existed since that time, and coinage has been in circulation among urban people for 2500 years. In modern times, an expanding investment scene, combined with continuing inflation, has formed the background to an extensive import and export trade. The major industries continue to be tourism, clothing, tea, coffee, cotton, and the production of raw materials; in the last few years, there has been a surge in the importance of the computer software industry. Russia, the United States, Germany, and Great Britain are among the major importers of Indian products. Major Industries. The modern infrastructure was created by the British administration in the nineteenth and early twentieth centuries. The country still relies on a vast network of railroad track, some of it electrified. Railroads are a government monopoly. Roadways, many of them unsurfaced, total about 1.25 million miles. The first air service, for postal delivery, grew into Air India which, along with Indian Airlines, the internal system, was nationalized in 1953. In the 1980s a number of private airlines developed within the country, while international connections are provided by a multitude of foreign companies as well as Air India. International Trade. The major trading partners are Russia, the United States, the United Kingdom, and Germany. Political animosities have long ensured that trade with neighboring South Asian countries remains minimal, although there is now considerable transborder trade with Nepal, Sri Lanka, Bangladesh, and Bhutan. Division of Labor. The division of work is based on gender. Age also separates out the very old and the very young as people unable to perform the heaviest tasks. Those jobs are done by millions of adult men and women who have nothing to offer but their muscles. Beyond these fundamental divisions, India is unique in having the caste system as the ancient and most basic principle of organization of the society. 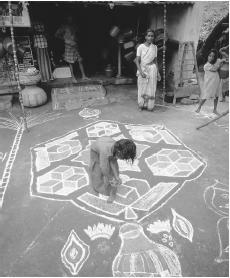 Each of many hundreds of castes traditionally had one occupation that was its specialty and usually its local monopoly. Only farming and the renouncer's life were open to all. Classes and Castes. The caste system is more elaborate than that in any of the other Hindu or Buddhist countries. Society is so fragmented into castes that there can be twenty or thirty distinct castes within a village. 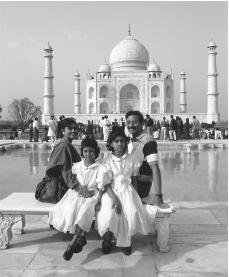 A family at the Taj Mahal, one of the most famous buildings in the world. characterized by one distinctive occupation and had its own level of social status. Because an individual cannot change his or her caste affiliation, every family belongs in its entirety and forever to only one named caste, and so each caste has developed a distinctive subculture that is handed down from generation to generation. Hindu religious theory justifies the division of society into castes, with the unavoidable differences in status and the differential access to power each one has. Hindus usually believe that a soul can have multiple reincarnations and that after the death of the body a soul will be reassigned to another newborn human body or even to an animal one. This reassignment could be to one of a higher caste if the person did good deeds in the previous life or to a lower-status body if the person did bad deeds. The highest category of castes are those people called Brahmins in the Hindu system; they were traditionally priests and intellectuals. Below them in rank were castes called Ksatriya , including especially warriors and rulers. Third in rank were the Vaisyas , castes concerned with trading and land ownership. The fourth-ranking category were the Sudras , primarily farmers. Below these four categories and hardly recognized in the ancient and traditional model, were many castes treated as "untouchable" and traditionally called Pancama . Outside the system altogether were several hundred tribes, with highly varied cultural and subsistence patterns. The whole system was marked not just by extreme differences in status and power but by relative degrees of spiritual purity or pollution. A curious feature of the caste system is that despite its origins in the Hindu theory of fate and reincarnation, caste organization is found among Indian Muslims, Jews, and Christians in modern times. In the Buddhist lands of Korea, Japan, and Tibet, there are rudimentary caste systems, their existence signaled especially by the presence of untouchable social categories. The major cities in modern times—Bombay (Mumbai), Madras (Chennai), Calcutta (Kolkata), New Delhi, and Bangalore—were essentially residential creations of the British administrators. Architecturally, professionally, and in other ways, they are therefore the most Westernized cities in India today. In these cities and their suburbs, there is now a developed class system overlying and in many respects displacing the more traditional caste system. As a consequence, there are many modern cases of intercaste marriage in all the cities, although this practice remains almost unthinkable to the great majority of Indians. Symbols of Stratification. There are many symbols of class differentiation because each caste tends to have its own persisting subculture. People's location in this stratification system thus can be gauged accurately according to the way they dress, their personal names, the way they speak a local dialect, the deities they worship, who they are willing to eat with publicly, the location of their housing, and especially their occupations. The combination of all these subcultural features can be a sure sign of where individuals and their families are situated in the caste hierarchy. Government. The national system of government is a liberal democratic federal republic, making India the largest democracy in the world. The country is divided for administrative purposes into twenty–eight linguistically–based states, plus a further seven small "Union Territories" administered directly by the central government in New Delhi, the national capital. Leadership and Political Officials. The central parliament in New Delhi consists of the House of the People ( Lok Sabha ) and the Council of States ( Rajya Sabha ). The states all have legislative assemblies ( Vidhan sabha ) and legislative councils ( Vidhan parishad ). Members of parliament and the state legislatures are selected in democratic elections. An exception to this procedure is that the Lok Sabha has two seats reserved for Anglo-Indian members, and of the 4,072 seats in all the state legislative assemblies, 557 have been reserved for candidates from the Scheduled Castes and a further 527 for candidates from the Scheduled Tribes. These provisions have ensured that the main minority populations have legislative representation and an interest in pursuing the electoral process. The Lok Sabha recently had sitting members from twenty one different parties. State legislatures also host a multiplicity of political parties. The head of state is the president, and there is also a vice-president, neither elected by general franchise but instead by an electoral college. The president is aided by a council of ministers, and appoints the prime minister of each government. This prime minister is the leader of the dominant party or of a coalition of prominent parties and has been elected as a member of parliament. The president has the power to dissolve a government and order new elections or to dismiss a problematic state government and declare "president's rule." Social Problems and Control. Indians have lived under the rule of law since ancient times. Hindu law was codified over two thousand years ago in the books called Dharmasastras. There is now one legal hierarchy throughout the land, with the Supreme Court at its head. Legal procedure is based on the Indian Penal Code (IPC) which was drafted in the mid-nineteenth century, and the Code of Criminal Procedure of 1973. The constitution promulgated in 1950 went further than any other South Asian country has gone in curtailing the influence of traditional legal systems that in practice applied only to the followers of a particular religion, whether Hindu, Buddhist, Muslim, Christian, Jewish, or Parsi. The huge legal profession helps push cases slowly through the complex apparatus of magistrates' and higher-level courts, sometimes creating the impression that litigation is a national sport. While fines and imprisonment are the most common punishments, the Supreme Court has upheld the legality of the death penalty. 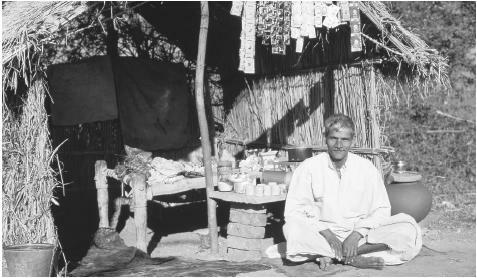 An Indian shopkeeper with his wares. 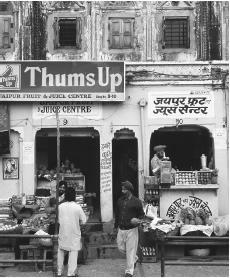 Small shops still make up a big part of the Indian economy. had 1,145,000 personnel. In 1998, the nation exploded a nuclear bomb as a test. Traditionally the family was responsible for the care of the poor, incapacitated, elderly, and very young. For rural populations this is still largely true. In recent decades, underfunded state governments, often with international help, have tried to create more jobs for the poor as a direct way of helping them. Beyond this, welfare organizations have helped, but they are largely private and often religious foundations with relatively little financing. The population in need of social welfare support is too vast for the facilities that are available, and these people are disproportionately concentrated in the cities. There are numerous nongovernmental organizations of social, political, religious, educational, or sporting natures. Every village, town, and caste and most temples have at least one associate formal organization and sometimes dozens. Beyond some attempts at registration, for example, of cooperative societies and charitable endowments, the government does not attempt to control organizations. Division of Labor by Gender. Gender provides the basis for a fundamental division of the work force, with perhaps only the lowest day-labor jobs and the most modern professions being regularly staffed by people of both genders. The Relative Status of Women and Men. "Patriarchal" is the word most commonly used to describe the traditional Indian family and the gender relationships within it. This is true in all family systems except the defunct matrilineal system of the Nayar castes in Kerala. Within all branches of Hinduism, priests can only be male, though they may be boys. In Islam, the leaders of a prayer group are males. In Zoroastrianism and Roman Catholicism, only men can function as priests. It is said that a woman must first obey her father, then her husband, and then her son; this seems to be the normal pattern as she goes through life. The opinion of the male head of household is especially important in the arrangement of marriages, because in most religious communities these are effectively marriages between two families. At such times, romantic preferences get little consideration. Since it is the male head who typically controls the family's finances, it is he who pays or receives a dowry at the time of a child's marriage. Although older women may be very influential behind the scenes, they wield little legal authority in property and marriage matters. Marriage. Although the different regions and religions have considerable variety in marital arrangements, the arranged marriage is a traditional feature of virtually every community; today, except among the urban middle classes, it still is widely practiced. Marriages that are not arranged by the couple's parents, often termed "love marriages," are looked down on as impulsive acts of passion. The more usual style of marriage unites a couple who have barely met beforehand. It is through the institution of arranged marriage and its correlate, caste endogamy, that parents exercise control not only over their adult children but also over the social structure and the caste system. Generally, the country has two main types of marriage: a north Indian one in which the man must not marry a closely related cousin and a south Indian one in which a cross-cousin, whether the mother's brother's daughter or the father's sister's daughter, is the ideal spouse. Many south Indian castes also permit uncle-niece marriage. Maharashtra state has intermediate forms. Domestic Unit. The residential unit is normally the household, but this unit varies widely in its structure, from housing a large extended family of three or four generations to a household made up of a lone widow. In large buildings with many rooms, it is common to find a number of discrete households, especially in cities; each of these households may be distinguished by its use of a common cooking hearth and perhaps by depending on a common source of funds. In crowded urban conditions, each room may constitute a separate household, as may each small grass hut in a roadside encampment. Inheritance. The written will is largely unknown except in modern urban areas. The tradition has always been that sons inherit property and status from their fathers and that daughters can hope to receive a dowry at the time of their marriage. However, there is much local and caste variation in precisely who inherits. In some groups, the oldest son inherits everything and then makes an accommodation for his younger brother and provides his sisters' dowries. In other groups, the brothers may inherit equal shares, except that the youngest brother inherits the house. Other patterns occur, but in general, although modern law states that daughters should inherit equally with their brothers, this almost never happens except in Islamic families. Kin Groups. The largest kin-based group is the caste, of which there are several thousand. A caste is an endogamous unit with its own traditional occupation and rank. It is made up of a number of clans, which are also kin-based but are exogamous and often intermarrying units. The clan in turn is made up of smaller and more localized groups called lineages, which are also exogamous. A caste may include hundreds of lineages of varying size and status, depending on how many generations of depth they claim. Major lineages commonly are composed of minor lineages, but the smallest are so localized that they are made up of a number of neighboring and closely related extended or nuclear families. Thus, a caste is endogamous, but all the kin-based units below it are exogamous and follow rigid rules about which clans or lineages are allowed to inter-marry. Infant Care. Infant care is almost completely the responsibility of mothers, older siblings, and grandmothers. When the mother works in the fields or a factory, a grandmother commonly is the chief provider of daytime care for an infant. After about the age of two, older sisters spend much of their time in this activity. Child Rearing and Education. In 1995, the government spent over 2 percent of its resources on education. Although the government's goal of eradicating illiteracy among people age fifteen to thirty five by the year 2000 has not been achieved, there has been a steady decrease in illiterary since the late nineteenth century. Among people above age six in 1991, 52 percent were literate, a 9 percent increase from 1981. Kerala state has the highest rates of literacy. However, nationally there remains a great sexual disparity: While 64 percent of men were literate in 1991, only 39 percent of women were. The central government is more interested in military power than in literacy, and millions of rural parents, especially Muslims, feel that the schooling of girls is a waste of time and money. Only the establishment of sixteen as the minimum legal age for marriage has made it possible for many girls to get their parents' reluctant permission to attend school. While in earlier times missionary-run schools were important, especially in rural areas, in the last century local and state schools have educated the vast majority of students. Over the last half century universal school attendance for eight years, equal opportunities for female students, relevant vocational training, and improvement in the quality of classes and textbooks have been national goals, with an emphasis on free and compulsory education for everybody from ages six to fourteen. However, there has been a recent growth of privately run schools, many associated with religious organizations, which tend to do a better job but commonly charge fees. Higher Education. There were 166 universities in 1996, including thirteen central universities which are the oldest, best known, and best funded. The rest are run by state governments or religious foundations. Funding, hiring professors, and setting educational standards in all universities are centralized through the University Grants Commission, which was established in 1956. About a hundred colleges throughout the country have an autonomous status, but others are branches of major universities within their states. In 1996 there were 6.4 million university students enrolled throughout the country, of whom 5.7 million were undergraduates and 2.2 million were women. There are 418 institutions that grant degrees in engineering and technology and 1,029 that award diplomas. Adult education programs combat illiteracy, lack of knowledge about family planning, and inadequate understanding of new farming techniques. Such programs tend to be more accessible in urban areas. A major hurdle has been the language of university instruction. The central universities generally teach in English and produce graduates with internationally acceptable credentials, but most of the smaller universities teach in the local (state) language so that their students' skills are not easily transferable even to other parts of the country. The opportunities for graduate study overseas are much reduced for this category of students, and even the acquisition of up-to-date textbooks can be a problem. Indians are usually very hospitable even when poor and go to considerable lengths to make a visitor feel comfortable. Women normally adopt a deferential attitude toward men, especially to their husbands and fathers-in-law. All the people tend to show deference to religious figures and government officials. A woman decorates the streets with vibrantly colored rice powder paintings during a festival in Madurai, India. Religious Beliefs. In the 1991 census, 82 percent of the population was enumerated as Hindu. However, 12 percent of Indians are Muslim, a fact that makes this one of the largest Islamic nations in the world. The next largest religious category is Christians, who make up only over 2 percent of the population and are closely followed in number by Sikhs. The only other groups of numerical significance are the Buddhists (less than 1 percent) and the Jains (less than half a percent). Rituals and Holy Places. The thousands of rituals and millions of shrines, temples, and other holy places of many faiths defy categorization here. For Hindus, large pilgrimage temples are the holiest centers, whereas for Muslims the tombs of saints ( pir ) are the most important. For Buddhists, many of them overseas visitors, the sites associated with the Buddha are crucial. 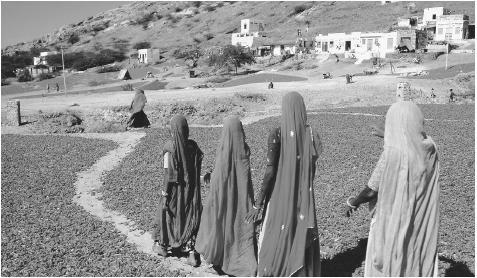 Women walk on a trail through drying chilies in the Bundi District of Rajasthan. noted for their Towers of Silence in Bombay and a few other cities: stone structures where corpses are exposed to the air and particularly to the vultures that congregate there. Most Hindu communities have a fundamental belief in reincarnation. The basic idea is that one's soul can be reincarnated for an unknown number of rebirths and that what the soul is to be reincarnated into depends on the balance of one's sins and good deeds in past lives. This belief provides the justification for the inequities of the caste system: One is born into a particular caste, whether high or low, as a result of the accumulated virtues or sins of one's soul in a previous life. One can never hope to move out of one's caste in this life but may do so in the next reincarnation. Particularly evil individuals may be reincarnated as animals. Hindus normally cremate the dead on a pile of logs, but the very poor may resort to burial. Extremely saintly figures may be buried in a sitting position, as are members of the Lingayat sect. India has a tradition of medical healing, teaching, and research that goes back more than two thousand years to the two basic medical treatises written by Charaka and Sushruta. Today the country has four major medical systems as well as dozens of localized and tribal ones that depend on herbal treatments. The oldest of the four systems is still widely followed under the name of Ayurveda , meaning "science of long life". It is highly developed, with its own hospitals, clinics, pharmaceutical factories, and medical textbooks. It depends primarily on non invasive herbal treatments. The diagnosis and treatment emphasize a holistic approach. Sidda is a distinct tradition that developed in south India and follows principles of physiology close to those of Ayurveda. Diagnosis depends on a careful reading of the pulse. Treatment is mostly herbal and psychological. A third medical tradition is called Unani. This system came to India with Muslim travelers and was developed under the patronage of the Mughals. It emphasizes holistic diagnosis and treatment, but the theory of human physiology is distinct. All three of these systems attribute disease to an imbalance between underlying constituents. The fourth and most widely favored system is biomedicine, or scientific medicine. It has been used in the cities for three centuries and is practiced in the best hospitals and training colleges. India has about 140 medical colleges. Public health is a major concern of every state government because of the continuing incidence of epidemic diseases, high rates of infant mortality, and the need for family planning (usually sterilization) to control the growth of the population. Public holidays in most states include 1 January (Gregorian New Year), 26 January (Republic Day, when the constitution was adopted), 1 May (International Labor Day), 30 June, and 15 August (Independence Day), 2 October (Gandhi's birthday), 25 December (Christmas), and 31 December (New Year's Eve). Parsi New Year and Telugu New Year, both locally celebrated, fall at different times. Support for the Arts. Historically, the arts flourished under the support of two main categories of patron: the larger Hindu temples and the princely rulers of states both small and large. Over the last two centuries, the patronage of British residents and art collectors has become important. In independent India, a national art institute, the Lalit Kala Akademi, promotes the visual arts through lectures, prizes, exhibitions, and publications. The government supports the Sahitya Akademi, which was set up in 1954 to promote excellence in literature; the National School of Drama (1959); and the Sangeet Natak Akademi (1953), which promotes dance. Literature. India has some of the earliest literature in the world, beginning with Sanskrit, which may be the oldest literature in any Indo-European language. The Rig Veda is the oldest of the four Vedas , long religious texts composed in an early form of Sanskrit some time late in the second century B.C.E. It was followed by three other Vedas , all liturgical in character, and then by the principal Upanishads during the eighth through fifth centuries B.C.E. The first significant secular document in Sanskrit was a sophisticated grammar that fixed the structure of the language, probably in the fourth century B.C.E. Then, during the reign of Chandragupta Maurya, the text of the great epic Mahabharata , the world's longest poem, was established around 300 B.C.E. , although it continued to be developed until about 100 C.E. About 200 B.C.E. there emerged the second great Sanskrit epic, the Ramayana , which probably took on its final form four centuries later. Both epics incorporated material from extant folklore. By roughly the third century B.C.E. , the Tripitaka or Three Baskets , the Buddhist canon in the Pali language (closely related to Sanskrit), was fixed. It was soon to become the most influential body of literature in the eastern half of Asia and has remained so to the present day, especially in Chinese and Japanese translations. In that era the image of the social structure of India was codified by two books. During the late fourth century Kautilya, who is said to have been the prime minister Chanakya, wrote the Arthasastra , a Treatise on the Good , which was rediscovered in 1909. Shortly thereafter came the compilation of Manu's Laws (Manusmrti). This treatise on religious law and social obligation described in detail a society, possibly a utopian one, in which there were four caste blocks, the varna , each of which had its own occupation, status, and religious duties. This book continued to exercise an immeasurable influence on Indian society for the next two thousand years and the varna model is still a popular image of Hindu caste society. Around 150 C.E. , there began in south India the Tamil Sangam, an academy of poets and philosophers that lasted for decades. While its history is shrouded, it set the stage for an outpouring of medieval poetry in Tamil, a Dravidian language. Some of this work was devotional, but much was secular in its appeal, including the first known work of Indian women writers. The most famous example of this poetry was the Purananuru , an anthology of four hundred poems praising Tamil rulers. Equally important, the Kural was a collection of moral maxims compiled by Tiruvalluvar in perhaps the third and fourth centuries. It has been likened to a Tamil Koran. At about the same time, there was a flowering of Sanskrit drama in the northerly parts of India. In the fourth or fifth century lived the greatest Sanskrit poet, Kalidasa. The best known plays that have survived from this era are Shakuntala and The Little Clay Cart , the former written by Kalidasa and the latter a comedy also perhaps written by him. During the Middle Ages, science and philosophy flourished in Sanskrit texts. Perhaps the best known, if the least scientific, work was the Kama Sutra or a treatise on love by Vatsyayana, who wrote it in a legal style of Sanskrit in about the third century. The Middle Ages witnessed an outpouring of religious and philosophical literature not just in Sanskrit, which was still the prime liturgical and scholarly language, but also in a number of regional languages. Logic, metaphysics, devotional poetry, and commentary developed over the centuries. 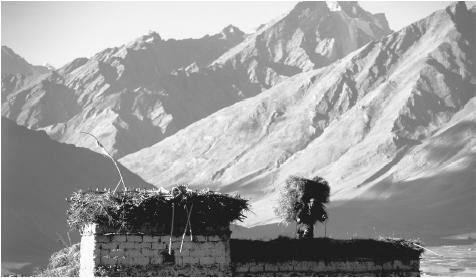 A farmer leans under the burden of a harvest as it is carried to the top of a building in Zanskar Valley, Ladakh. literature written in the medieval Kannada language. At the end of the twelfth century Lilavati was written by Nemichandra, the first novel in that language. It was followed by other allegorical novels, as well as Kesiraja's grammar of medieval Kannada. Around 1020, another Dravidian literature, in Telugu, made its debut with the grammarian Nannaya Bhatta and the poet Nannichoda. At about that time the Malayalam language became differentiated from Tamil. A century later the oldest known manuscript was written in Bengali. In the twelfth and thirteenth centuries Mukundaraj became the first man to write poetry in Marathi. Early in the fifteenth century two poets brought Bengali literature into prominence: Chandidas and Vidyapati, with the latter writing in Sanskrit as well as Bengali. Contemporary with them were two Telugu poets, Srinatha and Potana, as well as the best-loved Hindi poet, Kabir (1440–1518). Kabir wrote in a medieval regional language closely related to Sanskrit. Although Kabir was a low-caste Hindu, he drew inspiration from Sufism and criticized the caste system, ritualism, and idolatry. He was followed in 1540 by the first important Muslim poet of India, Mohamed of Jais who wrote the allegorical poem Padmavat in Hindi. Contemporary with Kabir was one of the greatest of woman poets, the Rajput Mirabai, who wrote in both Hindi and Gujarati. A century before her, Manichand had written an important historical novel in Gujarati. In 1574 the Hindi version of the Ramayana ,by Tulsidas, appeared it was to be a forerunner of numerous versions of the Ramayana in regional languages. At that time there was a strong Persian cultural influence in some parts of the country. One ruler of the Muslim province of Golconda (later Hyderabad) was Mohammed Quli Qutub Shah, a poet who wrote in both Persian and Urdu, which was a new form of Hindi containing many Persian words and written in an Arabic script. In 1604, the Adi Granth , the canonical text of the Sikh religion, was established in Punjabi. Thirty years later there appeared, also in northwestern India, a book in Urdu prose, the Sab Ras of Vajhi. In more southern parts of the subcontinent the middle of the seventeenth century also saw the writing of the Kannada poem Rajasekhara , by Sadakshara Deva, the works of the Gujarati storyteller Premanand (1636–1734), and the influential Marathi poems of Tukaram (1607–1649). India has the largest film industry in the world. 1728, and the Italian Jesuit Beschi wrote the Tamil poem Tembavani in 1724 under the pen name Viramamunivar (it was not published until 1853). Also of interest was the eighteenth century "Indian Pepys" Anandaranga Pillai, a Tamil living in the French colony of Pondicheåry. His lengthy diary has been published in Tamil, French, and English. Another outstanding Tamil poet and bard was Tyagaraja. In the eighteenth century, there was a further flowering of Urdu poetry by Vali, Hatim, Sauda, Inch'a, and Nazir. By the time of Nazir, the British hegemony in India was well established, and along with it went the spread of regional printing presses, the opening of the first modern universities, and the increasing influence of European literary forms, especially in the English language. This influence is evident even in writers who published in their native languages. Bengal in particular experienced a great literary and intellectual renaissance in both English and Bengali, including the novels of Bankim Chandra Chatterji and India's first Nobel Prize Winner, the poet and dramatist Rabindranath Tagore. A parallel literary renaissance occurred in Hindi at the beginning of the twentieth century, with the first novels by Premchand. Tamil also began to produce novels with an English influence. The twentieth century saw a continuation of this modernization, fueled by the ease of publication and the increasing size of the reading public. An unexpected development during that century was the emergence of numerous world-class and prizewinning novelists writing in English, and often not residing in India. Pre-eminent today are the London-based Salman Rushdie, from Bombay, and the Delhi-based Arundati Roy, from Kerala. Graphic Arts. India has a multiplicity of visual arts extending back over four thousand years. Early painting has not survived, but urban architecture and some small sculptures have. Most of the thousands of stamp seals that have been found are masterpieces of glyphic art, showing the large animals of northwestern India in miniature relief. The main visual arts arose in the context of religious worship. Sanskrit handbooks still survive stipulating the rules for the production of Hindu religious statues, temples, and paintings. Distinctive regional styles of temple architecture are a feature of the landscape and a clear marker of the presence of Islam, Sikhism, Jainism, Christianity, and Hinduism in each part of the country. Within the Hindu temples there is a great variety of images of the deities, some skilfully carved in stone, some cast in bronze or silver, and some modeled in terra-cotta or wood. Painting was an ancient accomplishment, although the climate has not been conducive to preservation. One can still see second and third-century wall paintings and monumental Buddhist sculptures in caves in Ajanta (Madhya Pradesh). Despite Islamic prohibitions on the representation of the human face, painting and drawing flourished under the Moghul emperors. Realistic portraits, historical scenes, and botanical and zoological subjects were evoked with a sensitive line and a subtle pallet of colors during that period. Painting in oils dates back two centuries, to the time when the first European portrait painters began to work in India. Today there are many professional graphic artists, some inspired by old Indian traditions and some by modern abstract expressionism. Art schools, public exhibitions, and coffee-table books are the means of reaching their public today, while religious patronage has practically evaporated. Performance Arts. India has the largest film industry in the world. In 1996, 683 feature films were certified by the Board of Censors. Although television came to even rural India more than twenty years ago, the cinema remains the major popular visual art form. 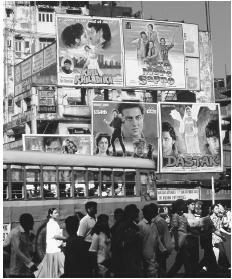 In 1996, India had 12,623 cinemas, with an attendance of ninety to one hundred million weekly. Radios are widespread, primarily as a source of light music, but not as a major source of information. India has long had government-sponsored national research organizations for the sciences, including the Archaeological Survey of India (1861), the Botanical Survey of India (1890), the Census of India (1867), the Ethnological Survey of India (1901, later the Anthropological Survey of India, 1946), the Geological Survey of India (1851), the Indian Forestry Service (1865), the Indian Medical Service (1786), the Indian Council of Medical Research (1912), the Indian Meteorological Department (1875), the Linguistic Survey of India, and the Zoological Survey of India. The antecedent of all these institutions was the Survey of India (1832), which did the first scientific mapmaking of the subcontinent. There has been an annual Indian Science Congress, a national conference, which began as the Indian Association for the Cultivation of Science in 1876. With independence, an overarching bureaucratic organization came into being, the Council of Scientific and Industrial Research, as well as an Atomic Energy Commission and the Tata Institute of Fundamental Research. To avoid centralization of these organizations in and around Delhi and Bombay, regional institutes of technology were set up in a number of large cities. The government also supports four national academies: the Indian National Science Academy in New Delhi, the Indian Academy of Sciences in Bangalore, the National Academy of Science in Allahabad, and the Indian Science Congress Association in Calcutta. Other centrally supported research councils include the Indian Council of Agricultural Research, the Indian Council of Historical Research, the Indian Council of Philosophical Research, the Indian Council of Social Sciences Research, and the National Council of Educational Research and Training. Achaya, K. T. Indian Food: A Historical Companion , 1994. Basham, A. L. The Wonder That Was India. Rev. ed., 1963. ——. Cultural History of India , 1975. Berreman, Gerald D. Caste and Other Inequities: Essays on Inequality , 1979. Bishop, Donald H., ed. Indian Thought: An Introduction , 1975. Bonnefoy, Yves, and Wendy Doniger, eds. Mythologies , 1991. Bose, Sugata, and Ayesha Jalal. Modern South Asia: History, Culture, Political Economy , 1998. Burrow, Thomas, and Murray B. Emeneau. A Dravidian Etymological Dictionary , 2nd ed., 1984. Council of Scientific and Industrial Research. The Wealth of India: A Dictionary of Indian Raw Materials and Industrial Products , 1948–1990. Dumont, Louis. Homo Hierarchicus: An Essay on the Caste System , 1970. Embree, Ainslie T., and Stephen Hay, eds. Sources of Indian Tradition. 2nd ed. 1970. Farmer, B. H. An Introduction to South Asia, 2nd ed. , 1993. Garrett, John. A Classical Dictionary of India Illustrative of the Mythology, Philosophy, Literature, Antiquities, Arts, Manners, Customs, etc. of the Hindus , 1973. Gole, Susan. Indian Maps and Plans from Earliest Times to the Advent of European Surveys , 1989. Government of India. India 2000: A Reference Annual , 2000. Hawkins, R. E. Encyclopedia of Indian Natural History , 1986. Hutton, John H. Caste in India: Its Nature, Function, and Origins , 1963. Johnson, Gordon, et al. eds. The New Cambridge History of India , 1987. Keay, John. India Discovered: The Achievement of the British Raj , 1981. Kramrisch, Stella. The Hindu Temple , 1980. Kulke, Hermann, and Dietmar Rothermund. A History of India , 1986. Kumar, Dharma, Tapan Raychaudhuri, et al., eds. The Cambridge Economic History of India , 1982. Majumdar, R. C., H. C. Raychaudhuri, and Kalikinkar Datta. An Advanced History of India , 1961. —— et al., eds. The History and Culture of the Indian People, 2nd ed. 1970–1988. Maloney, Clarence. Peoples of South Asia , 1980. Mandelbaum, David G. Society in India , 1970. Masica, Colin P. Defining a Linguistic Area: South Asia , 1976. Mehra, Parshotam. A Dictionary of Modern Indian History 1707–1947 , 1987. Mitchell, George, and Philip Davies. The Penguin Guide to the Monuments of India , 1989. Mode, Heinz, and Subodh Chandra. Indian Folk Art , 1985. Muthiah, S., ed. A Social and Economic Atlas of India , 1986. Queneau, Raymond, ed. Histoire des Littératures: I. Littératures Anciennes, Orientales et Orales , 1956. Radhakrishnan, Sarvepalli, and Charles A. Moore, eds. A Source Book in Indian Philosophy , 1957. Rapson, E.J., et al. eds. The Cambridge History of India , 1922–1947. Robinson, Francis, ed. The Cambridge Encyclopedia of India, Pakistan, Bangladesh, Sri Lanka, Nepal, Bhutan and the Maldives , 1989. Rowland, Benjamin. The Art and Architecture of India, Buddhist /Hindu /Jain , 3rd ed., 1967. Schwartzberg, Joseph E., ed. A Historical Atlas of South Asia , 1969. Sebeok, Thomas A., et al. eds. Current Trends in Linguistics: Vol. 5. Linguistics in South Asia , 1969. Shapiro, Michael C., and Harold F. Schiffman. Language and Society in South Asia , 1981. Sindh, R. D. India: A Regional Geography , 1971. Sivaramamurti, Calambur. The Art of India , 1977. Smith, Vincent A. The Oxford History of India , 1958. Srinivas, M. N., M. S. A. Rao, and A. M. Shah, eds. A Survey of Research in Sociology and Social Anthropology , 1972–1974. Stutley, Margaret, and James Stutley. Harper's Dictionary of Hinduism: Its Mythology, Folklore, Philosophy, Literature, and History , 1977. Thapar, Romila, and Percival Spear. A History of India , 1965–1966. Turner, Jane, ed. "Indian Subcontinent." In Jane Turner, ed., The Dictionary of Art , 1996. Tyler, Stephen A. India: An Anthropological Perspective , 1973. Watt, George. The Commercial Products of India, Being an Abridgement of "The Dictionary of the Economic Products of India," 1966. Williams, L. F. Rushbrook, ed. A Handbook for Travellers in India, Pakistan, Nepal, Bangladesh & Sri Lanka (Ceylon), 22nd ed. , 1975. Yule, Henry, and A. C. Burnell. Hobson-Jobson: A Glossary of Colloquial Anglo-Indian Words and Phrases, and of Kindred Terms, Etymological, Historical, Geographical, and Discursive , rev. ed., 1968. Thank you for dedicating so much of your time to disclose Indian culture to the world. I've been searching for information about this big nation's culture for my business school studies. According to literary scholarship, the main body of the Ramayana first appeared as an oral composition somewhere between 750 and 500 BCE. Cultural evidence (the presence of sati in the Mahabharata but not in the main body of the Ramayana) suggests that the Ramayana predates the Mahabharata Traditionally the epic belongs to the Treta Yuga, one of the four eons (yuga) of Hindu chronology, and is dated as far back as 880,000 years in the past. i was wondering if anyone could send me some info on any medical conditions that people from inda are predisposed to i am working on a project for a nursing course and it would be greatly appreciated if anyone thought to send me some. You did a great job here; however, I don't see any description of the dances and music of India. Please add this to your article as it is a very rich part of our culture. I also don't see anything about Indian cuisine. Other than that, it's good. Thanks so much for your help with my Geography assignment! Wow this is a lot of help in geography thanks! Keep up the good work it is great facts for homework! This is an awesome compilation of Indian information. I have to do a sociology project on another culture and I chose India. My step-uncle is from India, as is the family of a co-worker's best friend. But I had no idea India was so interesting and rich in history! Not the information I was looking for. I was looking for the history of clothing in India, but I ended up with the history of India. I am interested in more information on Pune India and the culture of the people. The majority of Sikhs do NOT eat meat. It is stated that they do which is incorrect. I like your article very much.I have some question in my mind,but first of all i would like to share few information.The establishment of Indian culture dates back roughly to 5000 years. It is a varied culture and has rich heritage.The western culture is somewhat newer.I think there is nothing wrong with adopting good things about a culture but a person must also not forget where he has come from and where does he/she belong.One must always remain rooted.Hindu culture is such a rich, vast and very old culture that some sporadic intrusion cannot make any difference. My point is, if Existence of western culture has given milestone to compare Hindu culture,they should blame no one for that,its only the Indians who are responsible for it.Now i would like to ask the question.Do you think the present imitation of the western culture is good for INDIAN tradition? Do the arts like painting, sculpture & music relate the culture of the country? Do you think that foreign culture effect Indian culture? Does culture has anything to do with self development? Helped me in my project! Great website. Lots of information that I was not aware of! Thank You SO MUCH ! project due.. helping alot thxx ! Thanks a lot that there are so much knowledge provided about india and its culture with nice and rare pictures once again so thanks. Remarkable !! I was wondering as to in what manner it would be best and most meaningful to the common audience to describe the India as a nation!! hello great info but not quite good site for people to recomend. the heading were not right but still it was nice written and helped me a lot . This article helped me a lot for doing my school project: Different Cultures,Traditions,Art and Religions in different parts in India.This article is very useful for me and I am thanking you for collecting data and making such article which is very useful for students like us.Once again thanks a lot. Thank you, I really needed information for my essay. I owe you!!! Love from England! how interesting, i felt as if every part of the world was the same but now i see there is amazing wonders worths living for! the world is truely an amazing place indeed! i will go there (to india) when i get older! wow and to think of how the outher countries could be! i find it great that we all are mostly a different race, beacause we have so many ideas! india is truley a maybe poor in some places! but the sight in all places to the eye is rich as gold!!! thanks for the info! i will share this website with some of my friends so they can learn about there countries! india is i want to go to india so bad ( bombay is a must ^_^) i never knew india had this much to learn about! it would be great if the pics where in color! i wish i could do ALL the countried for my project! how interesting, i felt as if every part of the world was the same but now i see there is amazing wonders worths living for! the world is truely an amazing place indeed! i will go there (to india) when i get older! wow and to think of how the outher countries could be! i find it great that we all are mostly a different race, beacause we have so many ideas! india is maybe poor in some places! but the sight in all places to the eye is rich as gold!!! thanks for the info! i will share this website with some of my friends so they can learn about there countries! india is i want to go to india so bad ( bombay is a must ^_^) i never knew india had this much to learn about! it would be great if the pics where in color! i wish i could do ALL the countries for my project! Thanks for halping me with my progect on India you were very helpful!! Please tell me like what other cultures that india because i am doin a project for school i need to know like whaqt other cultures they may have? Thanks, this helped me on my rescreach project. This was very helpful! Someone I know Mother Died...What can I do food, flowers, gift...what is done also her daugther got married..what should I send or do. Nice to see this article about my country. Well written with over 95% accuracy. We Indians treat guests to our land as Gods. In our ancient manuscripts there is a phrase- "Atithi Devo Bhava", meaning, a guest to your house is equivalent to a God visiting you. India is such a wonderful place! I want to know about Suttee in India, and What did they happen in this country? I am doing a school project and I need traditions of India people? Please update data; your census is of 1991. It shows literacy (Male: 64% & Female: 39%) but now it is Male: 82.14% and female: 65.46%; like this many other updates has to be done. this text is nice ano more infor very knowledgeble this is help for my interview sucessfully. thank you this really helped me especially in my social studies class. and thanks for providing it to me. Thanx so much it helped alot on my project about india i'll be sure to tell my whole geography class about it so thanx. This helped me a lot. Thanks everyculture.com! I got a hundred on my paper and i told my whole class about it. This is an awesome page and i will be sure to recommend it! a very good site,but i want to know what are the influences of mythology in cultures of india? India is very beautiful.I💕 India very much.Good information.I am very proud about this.This was a very good article.It is very good information. one more thing i would to like to guys..
in india, you will be crazy for food. there are tons of variety of food. you have to spend so long weeks to finish all type of food. food lover will defiantly enjoy India. I found this article to be very informative. I am pleased to be able to use your site for a group project about India. This will be a site placed onto my favorites. I really like this page I hope you all enjoyed it too. loves it... I really love this page it gives amazing info thanks for being smart. Thank for a beautiful and thorough description of a country and culture. I was looking for clues for purchasing a baby gift. Because I know so little about the Indian mother and father, living and employed in the USA, it will need to be as neutral as possible and not thoughtful as I had wished. can anyone please suggest me some literature where i can get to read about the social conditions of people of India in history (atleast 500 years back)? i would like to know the way people of India have baby showers. What are good gifts to give to the people of India? I recently returned to the U.S. after living in India for 10 years. When I went there in 2003, I had no idea what lay ahead of me. I wish I could have had this information before going. It wouldn't have caused me to change my mind, but would have helped me to be more tolerant and understanding of the things my hosts weren't prepared to teach me. They thought I already knew their culture and traditions, so they seldom instructed/taught me what they were doing and why. This resulted in much confusion on my part at times, but my innate sense of humor and their unassailable warmheartedness and compassion not only enabled me to survive but to thrive. And the memories we created far outweighed the momentary embarrassments. This article is awesome!! I hope it will cause others to want to experience India firsthand. And it will help me as I continue to share India and my experiences with others here in the States. Thank you for this information,I got an A+ because of this website.Thank You. This article in big help for us in GMMS middle school . Thanks for creating this for us ! Can you list some proteins that they do eat? It is for a project and we must rely on this site for it. Everything else was great. Thanks, I used this for my report! Some good information on what I needed to know! Culture of India forum given detailed information about all aspects of India. This has help me in writing my research paper. Thanks for all the information! But do you know more about modern art & fashion lifestyle?